Ron Lovell is the last remaining original manager in the MSBL of Southern California. He has managed his Angels 29 of the 30 years taking a one year break around year 10. He has had good teams and bad while winning four league championships. He also works with Jay Ciambrone with the league club team “the Fire” and manages in tournaments. He has managed or co-managed three World Series championship teams. Bill Macey manages the Caddo Reds in the North Texas Amateur Baseball League 45+ Masters Division. The Reds have made four consecutive championship appearances, winning two of them. They are the defending 45+ Masters Champions. In addition to managing the Reds, Bill manages the NTABL Rookie League, giving of his personal time on Saturday mornings to teach new players the ways of the NTABL and MSBL. He also serves as our 35+ Veterans Division Vice President, helping other managers keep their roster straight, settling disputes and marshaling the draft at tryouts. 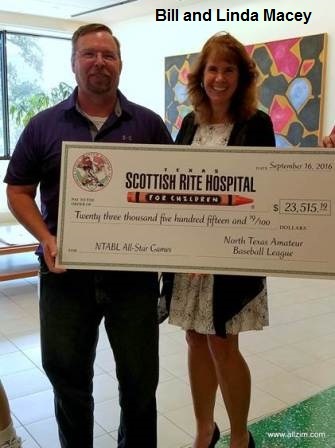 Perhaps most impressive is how instrumental Bill is in our charity fund raising efforts for the Texas Scottish Rite Hospital for Children. In 2016, Bill recruited his wife, Linda, to serve as chairperson for our annual charity event, raising a near record amount of money in her first year on board. The Macey’s, to borrow a phrase from their employer, have a Warrior Spirit and Servant’s Hearts. We don’t tell you nearly enough, Bill – THANK YOU!